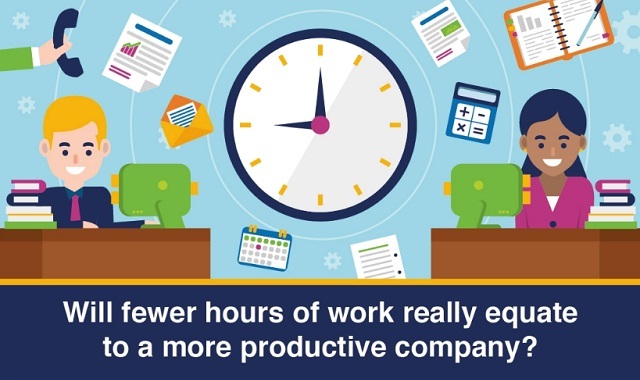 Will fewer hours of work really equate to a more productive company? #infographic ~ Visualistan '+g+"
The nine-to-five workday—or something darn close to it—is a reality for a whole lot of us. And, sadly enough, many of us regularly work much longer days. In fact, some figures suggest nearly 40 percent of Americans work more than 50 hours a week. But do all these hours on the job equate to better work? The short answer: no, not really. One review study found that people who work 55 hours or more per week have a 33 percent greater risk of stroke and 13 percent greater risk of developing coronary heart disease than people who work a 35 to 50 hour workweek. And employees that work more than 11 hours a day are 2.5 times more likely to develop depression. Shorter workdays, on the other hand, have some interesting potential benefits including a stronger economy and more productive, healthier, and eco-friendlier employees. Check out the infographic below to learn how shorter work days may benefit you.